← How 2019 Would Be For Aquarius Zodiac Sign? Why 26th January is a holiday? Many would answer that it’s because of Republic Day. But ask them what does that mean, you would get various confusing answers. Republic Day is basically the day when India became truly a Republic state. The Constitution of India came into effect on this day 69 years ago. Making this constitution was not an easy task at all. India got its independence on 15th August 1947 and on 28th August 1947, a Drafting Committee was born whose task was to frame a Constitution. Dr. B.R. Ambedkar was the chairman of this committee and this huge task took 2 years, 11 months, and 18 days to finish! There are many such interesting facts about 26th January and that’s why it is just not a holiday! Thus, explore some of the lesser known facts about this Republic Day and share the information with your pals too! The Indian Constituent Assembly adopted the Constitution on 26th November 1949 and it came into real effect on 26th January 1950. What does Republic mean? Republic refers to a state in which the supreme power lies in the hand of the subject or people and they elect a representative to run the state. It also refers to “no monarchy” and our constitution adopted a Democratic government. One may ask why 26th January was selected as the Republic Day? It is because it was on this date in the year 1930, Indian National Congress proclaimed a “Purna Swaraj” or Complete Freedom opposing the British Government. Till the time, the Constitution was at the drafting table, the state was following the colonial Indian Government of India Act. Thus, the head of the state was an appointed Governor-General and not an elected President. As the Constitution came into being, Dr. Rajendra Prasad became the 1st President of India. Do you know that the Indian Air Force was known as the “Royal Air Force”? On this day, this word “Royal” was dropped from the name and the new name was Indian Air Force. The whole nation waits to watch the Republic Day Parade on Television on 26th Several people have been the guest of honor for this Republic Day Parade. Do you know who the 1st guest of this Parade was? It was the then Indonesian President Sukarno in the year 1950 who graced this event. The Constitution of India is the longest one in the world. The makers of the Indian Constitution copiously read all the Constitutions of all the independent nations from four corners of the world and incorporated all the good things here. For example, the 5-year plan was taken from the Constitution of USSR while the division of power between the Union & the State was taken from the Constitution of Canada. 21 gun salutes follow the act of the President of India hoisting the National Flag on 26th January. This year, it is the 5th and the current President of South Africa who would grace this prestigious event on the 70th Republic Day of India. This year would mark the 150th birth anniversary of Mahatma Gandhi. So, the yearlong celebration would start on 26th January 2019. The Indian Air Force will be flying an aircraft which will run by blended biofuel. There will be 10% bio-fuel in it. This aircraft would fly over Rajpath with a “V” shape referring to “Victory” sign. In 2019 Republic Day Parade, a woman officer would be leading the Army Services Corps. And India will see this for the first time in history. And the famous Daredevil Motorcycle Team would also include a woman officer. An “All-Woman” contingent of Assam Rifles – one of the oldest paramilitary forces in India would also participate in Republic Day Parade. Well, this is also a first time in history! 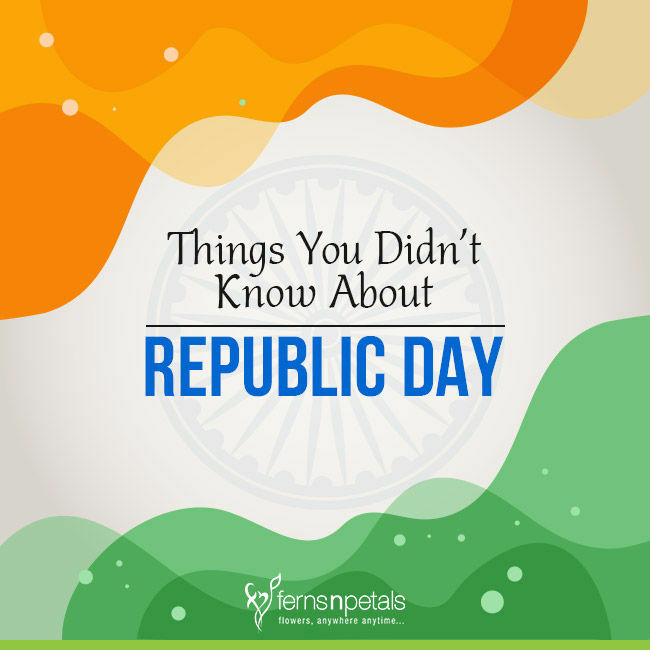 Circulate these interesting facts about the Republic Day celebration among your friends and relatives. Feel proud to be a citizen of the world’s largest democracy!